I don’t know if you’ve noticed, but our brains tend to work symmetrically, if they can. It is very simple to do tasks with both hands performing the same type of motion, but it takes a little more effort to get them working in different directions (for example, patting your head while rubbing your stomach). Maksim Shishov wants to challenge your brain to a double workout with his game app, Parallelus. Parallelus is a creative game involving only your thumbs (use other fingers, non-respectively, for extra effort). Simply place your thumbs on the bottom areas indicated, and move them to either dodge bombs or catch hearts. If you need to pause, just lift your thumbs from the screen, then replace them when you’re ready to play again; keep an eye on the indicator bar in the middle to get an idea of how far you have until the finish line. There are two difficulty levels, Easy and Advanced. The Easy pack comes with three different game modes, each with 50 levels: Evade, Target, and Combined. Evade has you dodging only, Target has you catching only, and Combined involves both. The Advanced pack, on the other hand, only has the Combined mode (also with 50 levels). 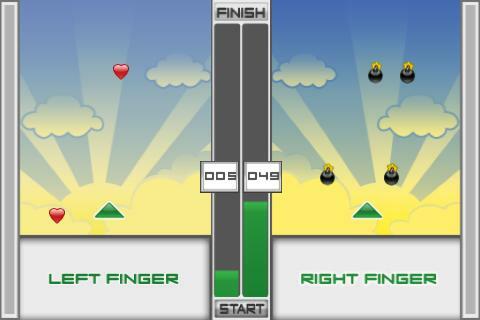 Parallelus, besides being a mouthful, lives up to its assertion of being a “game of mind.” The graphics aren’t the best (besides simple sky backgrounds, only two types of falling objects need to be rendered), and the music is generic (it almost sounds like elevator music, sometimes), but it doesn’t matter. You’ll be too busy concentrating on moving your thumbs to care. I started off on Easy for peace of mind, but quickly moved on to Advanced when I felt sufficiently prepared to deal with it. The levels get progressively harder, and there are over 100 of them, so you can potentially spend a lot of time on this time. However, the levels are all fairly short, so Parallelus is also great as a pick-up-and-play option. I’d like the option to replay a level, so I can get better scores, and it’d be exciting if more objects (other than hearts and bombs) were added. Otherwise, Parallelus definitely makes a great addition to your group of $0.99 games. AppSafari review of Parallelus was written by Julie Guan on December 21st, 2010 and categorized under App Store, Fun, Games, Puzzler. Page viewed 2985 times, 1 so far today. Need help on using these apps? Please read the Help Page.